DDR (Double Rate Rate) memory configurations are constantly evolving. With each iteration of the DDR specification, chip providers are finding faster ways to move data to and from memory. Their approach is twofold – to increase the speed on the memory component and then to find configurations which increase the speed between PCB components. The function of memory is to provide a stored data location to the component processing the information. Although microprocessors are an excellent example of a component that makes extensive use of external memory, other devices such as DSPs (Digital Signal Processors) and FPGAs (Field Programmable Gate Array) also use external memory. Regardless of which component is using the memory, the routes between the processing component and the memory(ies) need to be properly designed. The two concerns are propagation times and signal integrity. The signal cannot arrive late in a non-readable condition. Memory configurations have changed through the years to optimize the throughput of the data to and from the memory(ies). DDR (Double Data Rate) takes advantage of both the rising and falling edges in a clock cycle. In the past, memories only operated on the rising edge of the clock. Now that both edges are employed, any setup for the next signal, whether it be inbound or outbound, needs to be ready when the next edge occurs. DDR3 is the currently the industry standard. However, DDR4 is making its way into the industry, especially in gaming computers. Regardless of DDR version, PCB layout must be able to handle the strict timing requirements while maintaining the integrity of the signal. This is not an easy task. 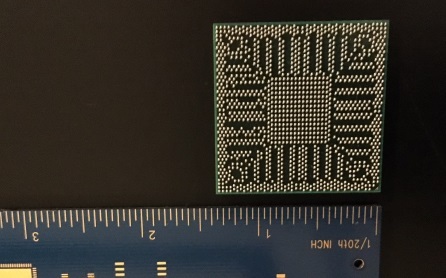 How can Nine Dot Connects help you with your DDR3 design? We can assist with any or all the steps of DDR3 design and layout, doing as much or as little as you require. Everything from simple design reviews to full-on turnkey layouts, even if it is just the DDR3 portion of your project. DDR starts with the initial design prior to layout. Memory components need to be selected, as each memory manufacturer has their own requirements and recommendations. The routing topology (fly-by vs, T-branch) must be considered when drawing out the circuit in the schematics. Each topology type has its advantages and disadvantages. 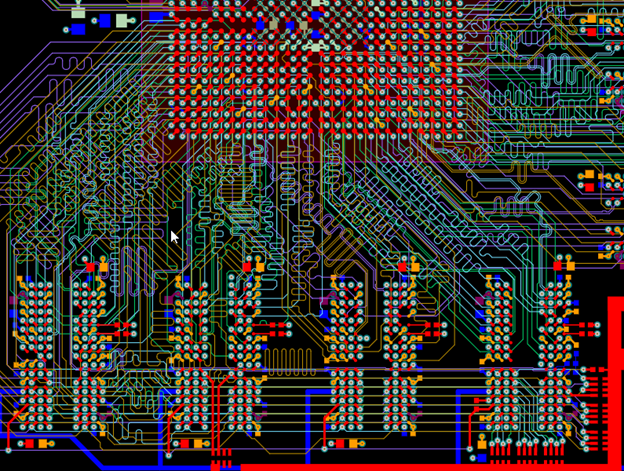 These details will determine the component placement on the PCB. The schematic will generate the netlist for the PCB layout designer to follow during the trace routing between these components. In many cases, DDR memory will be interfaced with an FPGA. Because they are configurable, the circuit board designer must balance the internal logic utilization aspect of the FPGA with the signals assigned to each of its pins. 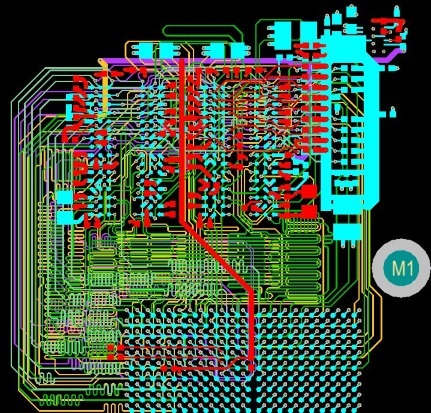 There can be hundreds of pins on one FPGA. 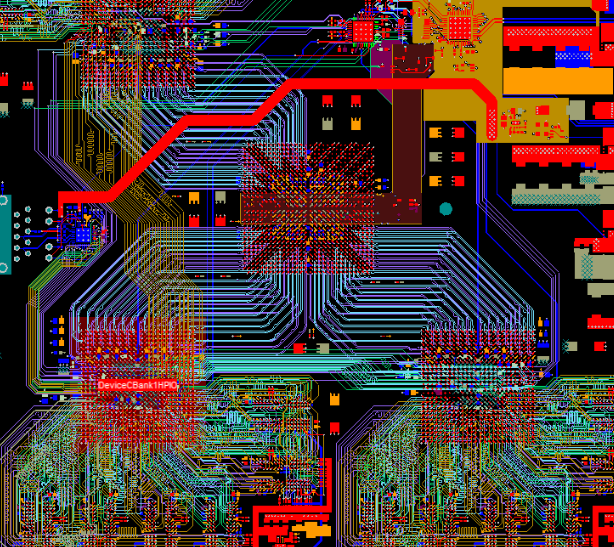 What may look good on the schematics and work internally in the FPGA could be a routing nightmare in the PCB layout. Because FPGAs are configurable, pin swapping is permitted to alleviate the routes from crisscrossing or that are too far distant from each other. However, this can impact FPGA internal timing. This is an iterative process of swapping pins, performing impact checks on the FPGA and modifying the schematic. Other aspects of the FPGA, such as slew rates (the speed in which the signal goes from logic ‘1’ to logic ‘0’ and vice versa), voltage levels (the voltage level required for a logic ‘1’ signal, and propagation delays (a.k.a. timing delays) that can be configured for each pin, must also be given consideration. The layout of the board is a major factor in the design. The number of layers (a.k.a. the stack up) will determine the impedances for each of the layers. Impedances must be matched during the routing of the DDR memory signals to avoid signal integrity issues. The number of signal layers are not the only consideration. Planes of copper must also be considered to assist the signal propagation through the trace and to minimize electromagnetic field interferences between signal paths. The nonconductive material (a.k.a. dielectric) that separates the copper layers is critical in the impedance calculation as well. To assist with the impedance measurements, the designer works closely with the board fabricator. Based on the criteria described above, the fabricator can provide the preliminary impedance numbers to assist the designer during the routing process. 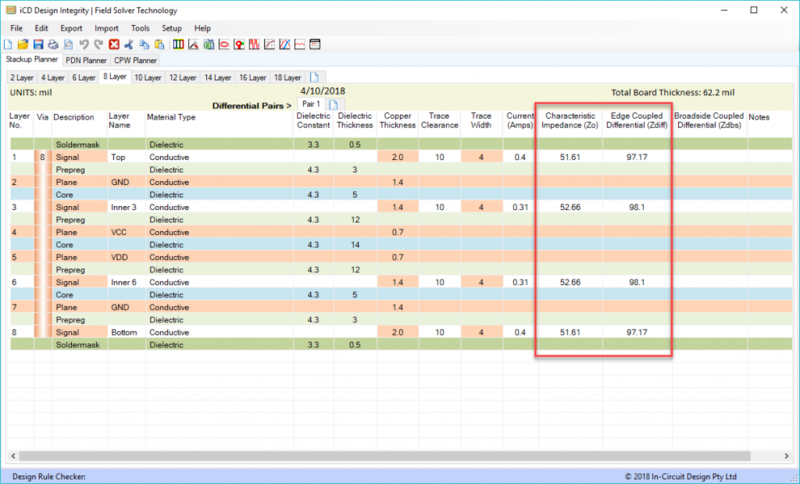 Additionally, the iCD planner is used to allow the designer to further calculate impedances based on the layers used, the desires trace widths and the spacing between traces. The layout of the board is constrained using rules. These rules prevent the layout designer from placing routes that would cause signal integrity issues. They also dictate constraints such as trace width and spacing, component clearances, and differential pair spacings, which are derived from the stack up of the physical board, as described above. Component placement is critical to minimize congestion points between the DDR memories and the processing component. Topography selection during schematic entry will dictate a good portion of the placement. The objective is to ensure the routes match timing requirements. This also requires an understanding how different layers impact the signal propagation speed. Propagation time for one layer is not the same for another. The designer must translate the propagation time into a wire length. Since high speed signals are involved, one cannot neglect the field energy produced when a signal goes from logic’1’ to ‘0’ or vice versa. It must be ‘channeled’ appropriately, otherwise it will radiate as noise, bleed onto other routes, and harm the signal itself. Voltage planes must be correctly referenced and return paths must be absent of any copper voids. This process should not be rushed. Each decision made on the board must be made with careful consideration. The components need to be placed in an optimal configuration. Each route must be fine tuned to meet the timing requirements. In high speed design, proper methods must be employed to mitigate noise and maintain signal integrity. In this brief strategy discussion, we purposely neglected mentioning other important items such as via type and size, drill pairs, and decoupling requirements, to name a few. In order to showcase the necessary steps involved in properly designing with DDR3 memories, we conducted two part webinar series. You can find details on this series here.